Happy Lunar New Year — the year of the dog. Situational awareness ... "Immigration bills fail in Congress, leaving ‘dreamers’ in limbo," per WashPost: "Weeks of intense negotiations for a bipartisan deal on immigration collapsed in Congress [yesterday], leaving hundreds of thousands of young undocumented immigrants facing possible deportation." President Trump didn't mention the word "gun" during his six-minute statement on the Florida high-school shooting. That wasn't an accident. No political figure in America has as much potential as Trump to push bipartisan gun control legislation, given his credibility on the issue with the Republican base. But sources familiar with Trump's thinking tell Swan that, on this issue, the president doesn't want to go to China. Trump said privately after the Florida school shooting that "we have to do something." But what exactly that something is, remains unclear to his staff. Trump told White House officials he wants "to know what our options are," according to an administration source. 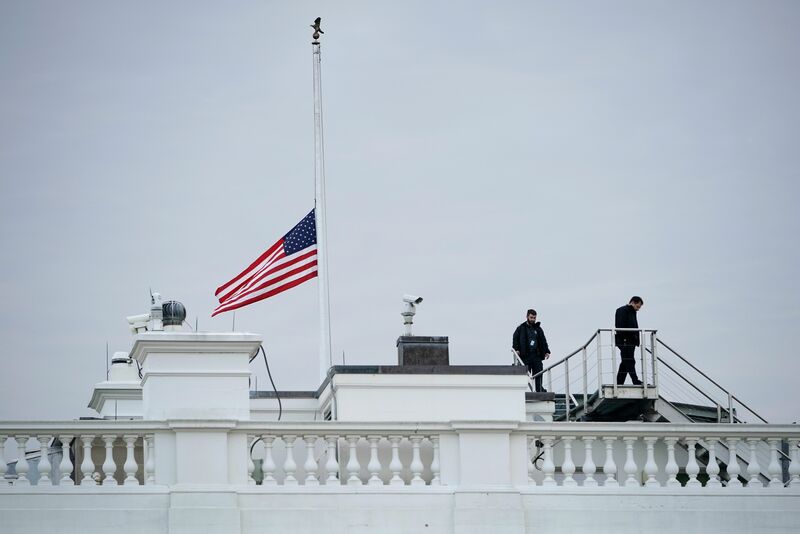 A senior administration official says the administration is setting up meetings with parents from Columbine and Sandy Hook, governors, state attorneys general, law enforcement and more, "and will be doing so continually for the next several weeks." The official said Trump "has a strong interest in background checks ... and other options of school safety — we are working on a number of options over the coming weeks on how best to make our schools safer." "As a safety/security president, he wants to actually make people safer, not just pay lip service (see national security and vetting policies)." "We need real solutions that work to make people safer, not just soundbites that sound nice." Between the lines: Trump is very focused on popular culture, and this is a cultural flashpoint. So the urgency of the issue and the 24/7 newscast compels him to do something. A source close to Trump said: "He takes pride in being not just the law and order president, but the safety and security president." The source continued: "[H]e said nothing about guns, nothing about gun control. I don't think that's a real possibility ... But something to do with school safety or mental health, that's possible." Trump viscerally felt the reaction from his crowds during the campaign when he gave full-throated pitches for gun rights. And no organization stuck by Trump like the NRA did. The group spent millions helping elect him, and kept spending even after so many others abandoned him in the wake of the "Access Hollywood" tape. Bottom line: There's no way — especially not in an election year — that Trump is going to alienate the Republican base by backflipping on the Second Amendment. He instinctively knows his voters would never forgive him. Following indescribable tragedy, the students of Marjory Stoneman Douglas High School have been so poised, so articulate, so mature as they appeared on TV to discuss their feelings. Their comments are so striking that you get the sense their generation will do better than ours has. On ABC's "World News Tonight," one student after another passed their iPhones to anchor David Muir, showing him photos of friends they had lost. 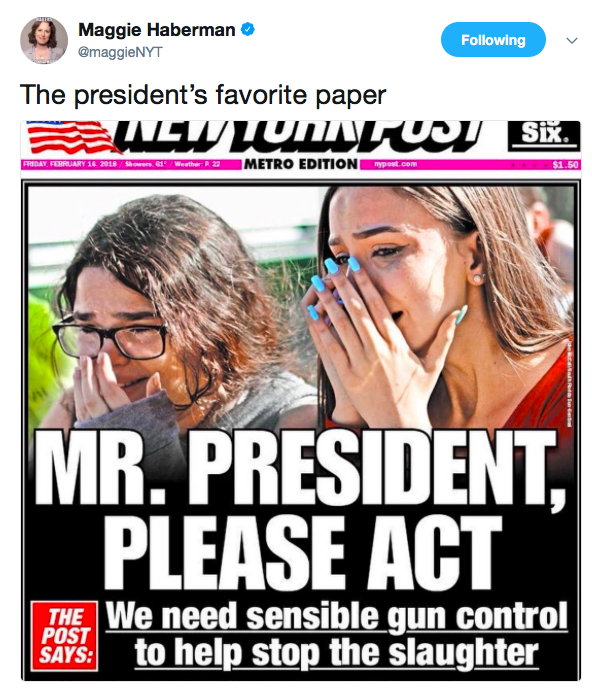 Lyliah Skinner, a student who survived the shooting, rejecting politicians’ thoughts and prayers and calling for action, to the N.Y. Times: “If they’re not able to purchase their first drink of alcohol, then how are we allowed to buy guns at the age of 18 or 19? Obviously whatever we have going on, it’s not working." N.Y. Times profiles of the 17 victims. 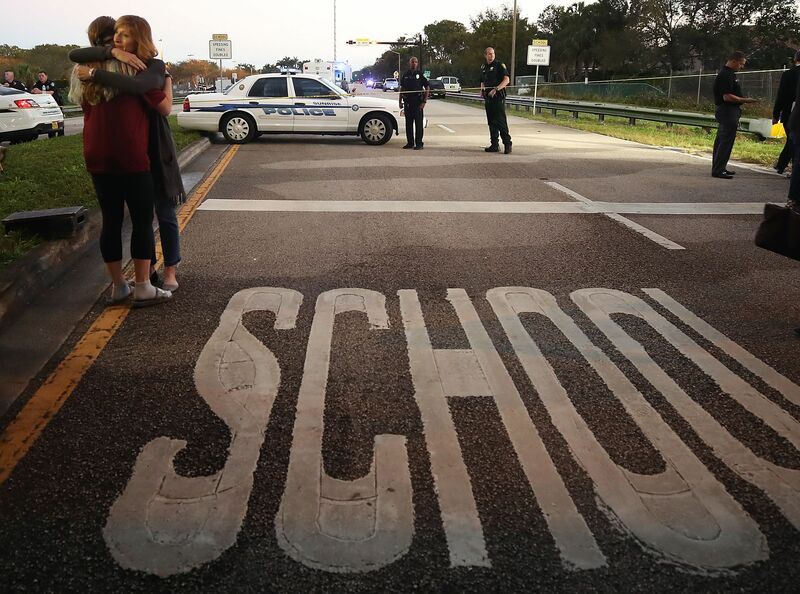 AP: "President Donald Trump is calling for a focus on mental health and school safety in response to shootings like the one that took 17 lives in Florida, but his budget would cut funding in both areas." "Morning" Joe Scarborough, on MSNBC: "I grew up in Mississippi, Alabama, Georgia, Florida, for most of my life. You went to church with people that went hunting with their kids. ... After something like this happens, it's not like it's just my friends in the media, ... it's my friends who have taken their children hunting, whose fathers took them hunting when they were 5 years old, that are saying: 'I don't need an AR-15 to go hunting. And I don't need an AR-15 to protect my family and my home in Pensacola. If somebody walks through my front door, I've got all the firepower I need.'" Jon Meacham, to Scarborough: "There's a huge opening here for a significant moment of leadership. If you're a United States senator or if you're the president of the United States, this is moment where you can speak out against the interest group that has an outsized influence over the lives of our children [the NRA]. Speak out, take them on. We remember political leaders, we remember generations — because this is not just the leaders, it's also us. Because we have to make it possible for them. We remember those leaders and those generations who stand up against clear, self-evident wrongs. This is a self-evident wrong. And if I were in the United States Senate today or the White House today, I'd be thinking that this is a moment to stand up and be counted." 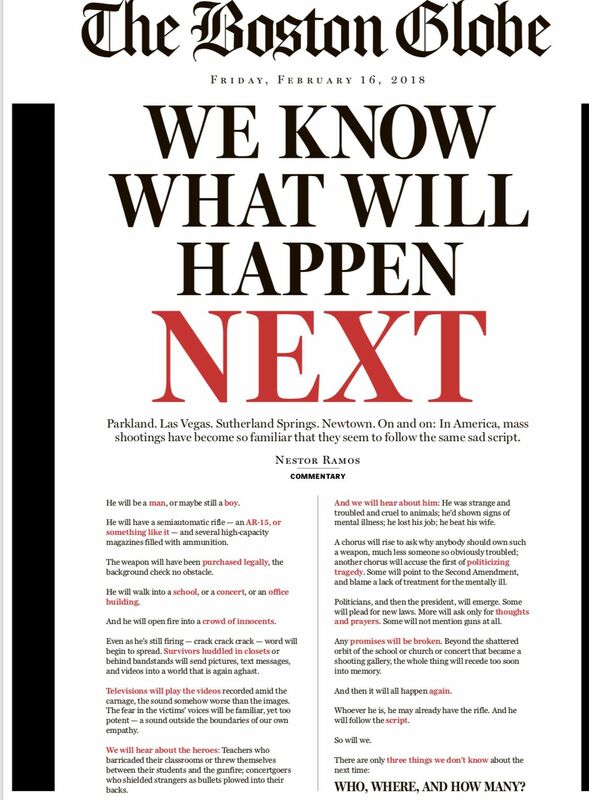 Read the editorial in the Rupert Murdoch paper, "Mr. President, it’s time to do something about guns." In 2006, "Trump and [Karen McDougal, a former Playmate of the Year] began an affair, which McDougal later memorialized in an eight-page, handwritten document provided to The New Yorker by John Crawford, a friend of McDougal’s. When I showed McDougal the document, she expressed surprise that I had obtained it but confirmed that the handwriting was her own." "[H]er account provides a detailed look at how Trump and his allies used clandestine hotel-room meetings, payoffs, and complex legal agreements to keep affairs — sometimes multiple affairs he carried out simultaneously — out of the press." Read on about the National Enquirer's role. Congress recently provided $6 billion for the effort, and it's getting the ball rolling on another legislative push as well. But lawmakers aren't yet sure what that push will entail. Why it matters: Because the problem is so sweeping, the push for a policy response is being pulled in several directions — from immediate treatment to law enforcement to community rebuilding to new medical practices. "In some ways, Peter Thiel is the embodiment of Silicon Valley success. Stanford brought him to the region, PayPal made him rich, Facebook made him richer, and now he doles out his millions to fund other entrepreneurs." "But Thiel, 50, has also never felt himself to be a part of Silicon Valley. An outspoken libertarian provocateur, ... Thiel has long tried to nudge America's tech capital rightward, with little success." "And after his endorsement of President Trump, a man who reveled in being an outsider has apparently found himself too far to the fringes for his liking." "Now Thiel is leaving Silicon Valley for Los Angeles — a move his camp describes as a bid to escape the political hegemony of the San Francisco Bay Area." "U.S. snowboarding star Chloe Kim tweeted about being 'down for some ice cream' [during a competition] in Pyeongchang, then about being 'hangry' because she hadn’t finished her breakfast sandwich." 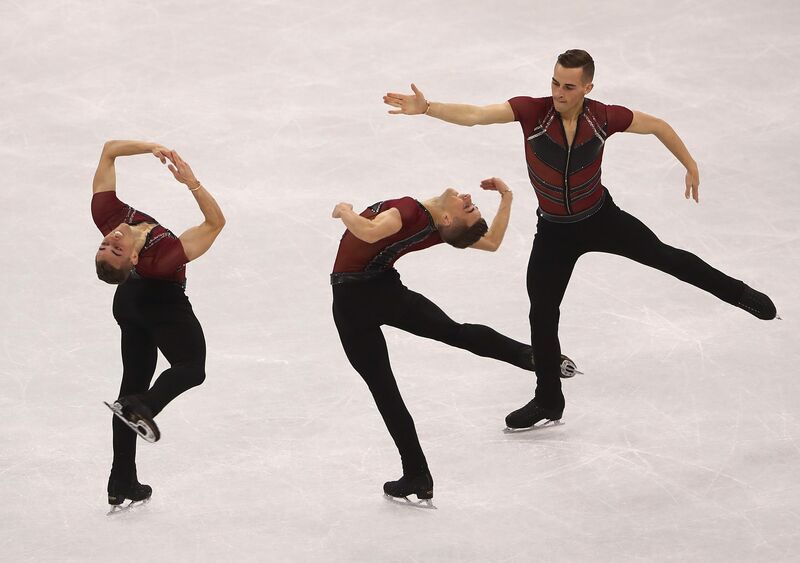 "[T]he very specific, highly calibrated fuel [the Olympians] put in their bodies — for energy, for health, for warmth, for a psychological and physiological edge — is an important part of what makes them excel." "Korean food is some of the world’s finest — savory, salty soups with fish so tender it falls off the bone; thick slabs of grilled pork and beef backed with spicy kimchi that many Korean grandmothers swear cures the common cold. But it’s very different from what many foreign Olympians are used to." "The U.S. team has its own chefs and dietitians ... And then there’s the food at two athletes villages, where nearly 3,000 athletes from 90 different countries — most of whom strictly follow unique food routines — get fed." "The two villages each have massive, ... 43,000-square-foot dining rooms where nearly 500 chefs and cooking assistants provide a combined 18,000 meals per day." "Each dining room is open 24 hours a day and offers about 450 different types of food in buffets that include Western, Asian, Korean, Halal, Kosher, vegetarian and gluten-free dishes."